Super Savings Item! 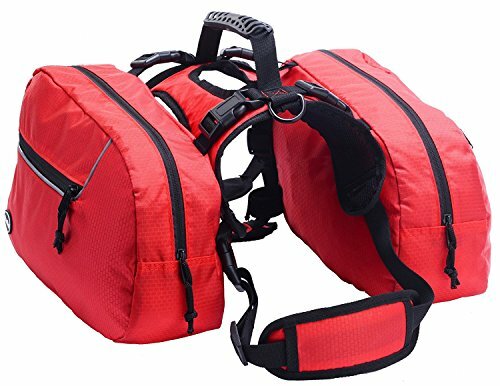 Save 34% on the BINGPET Dog Harness Backpack Doggie Saddlebags by BINGPET at Animal Lovers Center. MPN: 4334700580. Hurry! Limited time offer. Offer valid only while supplies last. Dogs Backpacks feature roomy saddlebag compartments, mesh pockets, durable zippers, and a harness that easily adjusts to the perfect fit. Dogs Backpacks feature roomy saddlebag compartments, mesh pockets, durable zippers, and a harness that easily adjusts to the perfect fit. - Each of the patches features a Velcro backing to allow you to easily remove or replace them to indicate your dog's status or to convert the harness for use on a different type of service dog. - Interior pockets and an elastic water bottle holder allow dogs to carry essentials on hikes and camping excursions, it's ideal for both quick getaways and everyday errands with your dog. You can even stow your own personal items in this pup pack. We're making it easy for you and your dog to get out and go together. - Reflective accents increase visibility in wild places. If you have any questions, please leave your messages, we promise to reply you within 24 hours. Please check the size before you confirm the order and we are always here for you. Thanks for your support and enjoy your shopping! Neck girth is 28-32 inches,chest girth is 27-39 inches,Back Length is 12inches.Some customer replied it is large than store size. Made with sturdy,super-tough nylon material,weatherproof and carefully double-stitched.Reflective accents increase visibility in wild places. If you have any questions about this product by BINGPET, contact us by completing and submitting the form below. If you are looking for a specif part number, please include it with your message.